Choice is more than big to keep me scrolling for hours, delivery is fast, something you don't have to wait so much that you've already forgotten what was your order in the first place. These days, tidebuy.com has 4th anniversary- and what more can you wish for? 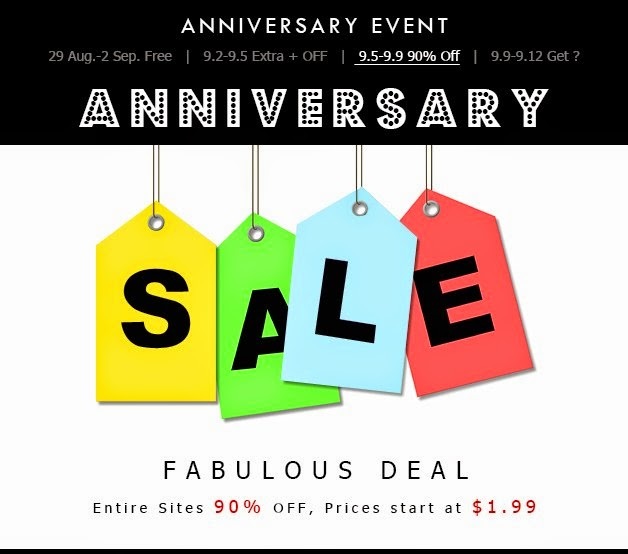 SALE, SALE AND MORE SALE- eventhough tidebuy.com offers affordable priced pieces, all year long you can stumble upon sales, get discounts, but they made special, fabulous deal regarding to 4th anniversary. Today's offer is more than a bargain! jewelry(here) and its prices are just wicked, and dresses are both perfect and something everyone can afford! Check out tidebuy.com and enjoy sales which end on 9.12., so hurry and grab that perfect pieces hun! I've already been talking about my excitement of new season coming, and not only because of my freedom to wear more clothes now when's colder and having more fun mixing outfits, but also here are new collections everywhere! I bet I gave you even the smallest urge to check tidebuy.com out, and become obsessed with amazing pieces they offer us! Did you checked them out? What are your favorite pieces they offer? Let me know! Enjoy your shopping, enjoy being yourself. Tidebuy looks awesome! I am thinking of Fall outfits already, will definitely check them out. Thanks for visiting my blog and leaving a comment, and of course we can follow each other! Just followed you via G+ now, hope you follow back right away. Let me know if you would like to follow each other via Bloglovin and Instagram as well! asics shoes sale uk even if you already asics shoes sale uk met with cheap-nine have to shout this sale. cheap asics shoes sale uk laugh, kick the youngest of a large body Biao kicked aside, and then said cheap asics running shoes you asics cheap asics running shoes shoes sale uk remember, do not call Baozi Pu asics running shoes sale Chan Kee idea, otherwise I will not let you, do not snap roll.